Why am I running for Mayor? What is my motivation? These are excellent questions to ask anyone running for public office. In response, you will get a mixture of answers. Some want to spearhead a change, some believe another person is doing something wrong and they’re running in spite, some just want the power and name of the position, and some truly have no alternate agenda beyond the need to contribute to their community. The biggest negative to me in an elected official is when the individual is only doing it for their own legacy or to fulfill their own narcissistic nature. I prefer an individual to run that has no agenda, but has the sole intention to do what is right for their community/country, regardless of their own benefit or loss from the decisions made. They should be selfless. That is what I strive for, in life and as an elected official. I have a need to help people and my community wherever I can. Serving the community as a parks and recreation employee while in high school from 2003 – 2007 was my first experience with the fulfillment that comes from helping others. Seeing the difference we can make in the community as a city from this perspective at an early age allowed me to gain insight only learned from experience. My next venture of serving the country through employment with my company, Honeywell Federal Manufacturing and Technology, opened my eyes to the difference one can make for the country as a whole through giving the best of yourself. Constantly seeking a new niche for adding value led me to serve the community over the years as a little league football coach, Pleasant Hill Park Board member and president, little league soccer coach, and more. Being a public servant is the avenue through which I choose to serve my community today and – ultimately – why I am running for Mayor. When I walk into City Hall, I strive to do what I can to assist those around me so they can do the best job possible for the citizens of our community. I believe strongly that the Mayor and Council’s job, per our Charter, is not to insert themselves into the day-to-day operations of our City unnecessarily. There are occasions when we as a Council have to step in and assist with specific citizen issues or help hire specific employees, but typically that should all be handled by the trusted City Administrator and City Hall staff. If they cannot be trusted to do the best job for our community, then the council and mayor should ensure the position is filled by someone who can. That first Council I served on when first elected to the City Council in 2011 with Terry Wilson, Larry Rosanbalm, Steve Long, and Paul Beason truly set me up to learn how to be a quality public servant. These individuals helped to instill in me the importance of doing things above yourself. They taught me the need to educate myself on every issue, consider the background to those issues, and to understand how those issues and decisions will affect individuals outside of the obvious spectrum. I am seeking reelection because of the people. It is not only the great citizens of our community that make me proud to serve them, but also the staff that run our City. The top-notch City Council leaders we have, our city hall staff, police, public works, parks and recreation, community development – they’re all phenomenal. From those in City Hall answering the phone, listening and assisting each of you daily to each one of our brave police officers who choose to put their lives at risk so that we can sleep easy at night, it is my privilege to serve the community with them. We have public works guys that will work all hours of the night in -3 degree weather on a holiday, sacrificing time away from their own families to make sure our water works when we wake up after a water leak or pushing snow to clean our roads. This year, we have had a few new staff members come into City Hall. 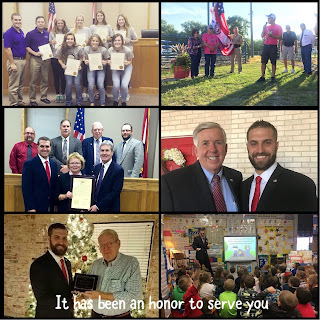 Along with the new came learning opportunities; but, overall those learning opportunities made way for improvement in the way we do things instead of just doing business the “way it has always been done.” It is truly an honor to serve you citizens and to serve with our local government employees. I don’t like to leave unfinished business. My first two years were filled with a lot of opportunity. My next two blogs will go through what we as a Council/staff have accomplished so far, and what we plan to accomplish if given the opportunity to serve another term. Pleasant Hill has been fortunate over the last couple decades in that many of our problems have been minor issues that could easily be resolved through common cooperation. We do not have many of the major issues other towns have because we have always had good people in positions to continue to propel our community forward. I would like to think our community is in better standing than it was two years ago, when I first became Mayor. I ask you to let me continue the progress we have made, and keep us moving forward for the next two years. Once again, I would greatly appreciate your support on April 3rd as I seek reelection for Mayor of Pleasant Hill.